Ernest Mihaly was born in 1920 on East 122nd Street in the Buckeye Road neighborhood where he still lives. He was baptized at the First Hungarian Lutheran Church. He grew up in this same Hungarian neighborhood and attended Hungarian Language classes. His schools included Harvey Rice, Audubon Jr. High and East Tech. He played the violin through his junior year in high school in the school Orchestra. He was drafted during WWII at age 18 and did his basic training at Camp Hood Texas, 148th Battalion. He sang in the 148th Battalion choir. His military time continued as he was sent to the Hawaiian Islands where he joined the 77th Infantry. He was stationed in Saipan, Okinawa and the Philippines. Not many people can claim this but Ernie was transferred from the Infantry into the 5th Air Force at Tokyo. He finally returned to the United States in 1948. Once back in the U.S. he met a Magyar girl, Goldie Feher and nine months later (11/20/48) they were married. He enrolled in Cleveland College then Western Reserve. He started his own Painting and Decorating Company in 1950 where he worked until he retired in 1990. From the beginning, Ernie has embraced and cultivated his Hungarian roots. For the last 35 years he has been President of that same First Hungarian Lutheran Church where he was baptized. In the past ten years you can add the additional title of Treasurer to his job description. He is a life member of the Hungarian Businessmen’s and Tradesmen’s Club. He is a proud and active member of the Cleveland Hungarian Heritage Society, United Hungarian Societies, Hungarian Cultural Center of NEO, Hungarian Charity Club, Cleveland Hungarian Development Panel and The Hungarian Cultural Gardens. He is almost single-handedly responsible for the restoration of the Hungarian Garden, working tirelessly on everything from digging to planting to repairing to fund raising and many things in between. To this day he works hands-on to support all things Hungarian. 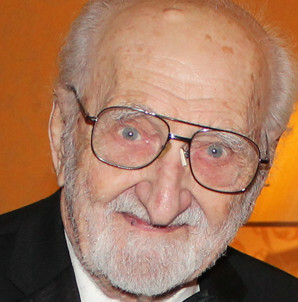 He was honored in 2013 by The Cleveland Hungarian Heritage Society.